With an increase in contract workers and robots, the work landscape is ever changing, according to James R. Stone III, director of the National Research Center for Career and Technical Education at the Southern Regional Education Board in Atlanta. 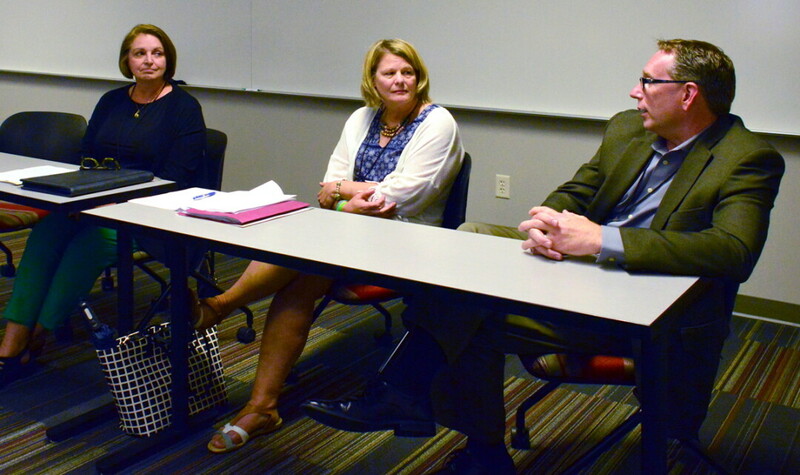 Stone spoke at the Career and Technical Education Summit June 18-19 at UW-Stout in Menomonie. The event was for stakeholders in the career and technical workforce education field. About 90 people attended the summit in Harvey Hall. Robots are not only moving into manufacturing but farming, medicine, and human resources professions, Stone said. Meanwhile, it is getting more difficult to find electricians, plumbers, and carpenters. Apprenticeships need to increase. Wisconsin has youth apprenticeships, but 70 percent of students in Austria and 60 percent in Germany take part in an apprenticeship, he said. The Southern Regional Education Board works with 16 member states to improve public education at every level. It was created in 1948 by Southern governors and legislators who recognized the link between education and economic vitality. A panel discussion, “Developing Leadership Potential in Others” featured Timm Boettcher, president and chief executive officer at Realityworks in Eau Claire, which is known for infant simulators; Chris Stratton, retired Menomonie school superintendent and educational consultant with CESA 11; and Lisa Maas, vice president of Human Resources at Northeast Wisconsin Technical College, Green Bay. Boettcher said some industries are paying educators to learn about their companies to help bridge the gap between education and industry and to bring real-world examples back to classrooms. “Getting out there and learning about the real world, they can bring back ideas for curriculum changes,” Boettcher said. Stratton said career and technical education teachers from Menomonie would visit business and industry for professional development. “Any time you can do some meaningful exchange, there is learning on both parts,” Stratton said. Maas said employers need to understand the importance of the workers and how they help industry to succeed and particularly to grow leaders from within a company. Boettcher has had to learn to allow people to fail, trusting they will learn from it, he said. UW-Stout offers a Bachelor of Science degree in career, technical education, and training, as well as a master’s, doctorate, and leadership certificate in the field.